January 2014: Four Unique Adventures! This month we have been on four very different adventures. Our first adventure took us to The Jacobs’ 150 acre property on Glorieta Mesa. It is a beautiful place with ruins from Spanish settlers as well as old Native American ruins that are unexcavated. We hiked to the Spanish ruins, and then up a very deep arroyo to the top of a small mountain. The ruins on the mountain are buried under the earth, but it is clear that the rocks have been moved in a specific formation to make walls. We talked about why the people would want to build a settlement on top of a mountain, and were amazed by the number of rooms we could count. Evidence that this settlement was long ago is clear – the pinon trees had grown up around and close to the walls. Coach Bob told us stories and we enjoyed imagining life from this great vantage point on the mountain. Overall, it was a great day of exploration! Our second adventure of the month took us first to Fort Marcy where Owen led us through a few soccer drills and then a game. It was fun to get everyone playing, even those who had never played before! Afterward, we walked to the New Mexico History Museum where we enjoyed the many artifacts in permanent exhibit of New Mexico history, as well as the current Cowboy exhibit. Dressing up and pretending to be cowboys and girls was a blast! Our third adventure this month took us to the New Mexico Museum of Natural History in Albuquerque. Everyone loved seeing the exhibit about the formation of the universe and the dinosaurs. We watched the movie “Ice Age 3D” which was a perfect complement to our study of the ice age including sabre tooth tigers and wooly mammoths. We ate lunch at the park across the street where we noticed a pigeon that had a wire ring attached to it’s foot. Sadly, it was trash and seemed to prevent him from flying (very far). He was able to fly far enough to get away from us, a lot!! We finally outsmarted him. Clayton put a stick through the ring attached to his foot so he could not fly off. Ms. Katie then held him while Ms. Beth removed the offending trash. It was a big relief to finally get him and deeply satisfying to see him fly off freely – up and away! We finished our day at the Grossology exhibit where we learned all sorts of interesting and gross facts about the human body. We got to climb on our largest organ, the skin, make unmentionable noises and learn all sorts of facts from Mr. Nose Faucet, among other fun things! Our final adventure in January was in two parts. After some park time at Fort Marcy, we spent the rest of the morning at Carlos Gilbert in Mrs. Porterfield’s second grade class. Esha Chiocchio from Got Sol came and showed us a great PowerPoint presentation on Renewable Energy and Biomimicry. Journey students Clayton and Owen, shared our class science experiment which demonstrated three types of energy: heat, light and motion using primarily candles, a foil pan, and a bottle. This all tied in perfectly with our study of the needs of early humans. Fire, still a source of much of our energy today, was an important discovery to humans. We spent the afternoon on our land in Chupadero learning and practicing fire making skills. 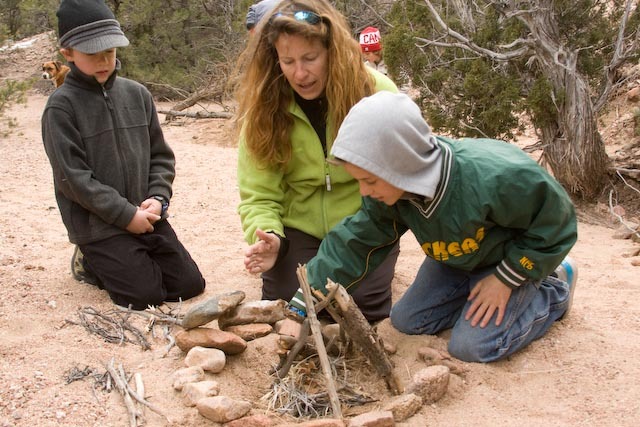 Fire making is a powerful and important skill for wilderness survival and nature connection, and certainly proved to be a hit with all the kids!